Boreal Bliss Yoga Retreats Presents our 11th Minnesotan Retreat! 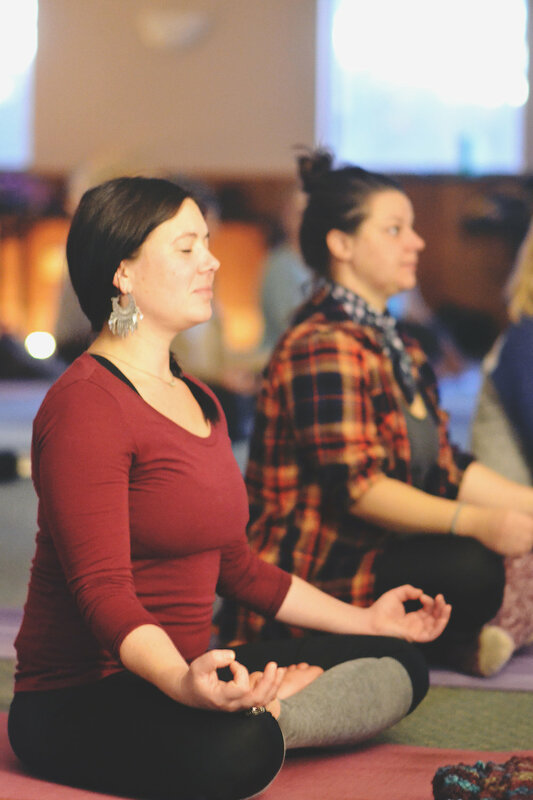 Find your bliss as we dive deep into the principles and practices of pranayama (breathing), meditation, and movement with experienced instructors; Bryana Cook and Joella Erin, and workshop host Stacy Nightwine. Tap into stillness amidst the chaos. Let go and experience multiple ways yoga can improve your daily life. Interested in meditation but not quite sure where to start? Have a yoga practice, but looking to deepen it? Curious about breath, mudras, sound healing, and energy? Seeking a greater understanding of yoga asana and myofascial release? Whether you are new to yoga, or an experienced practitioner, this retreat is perfect for you. We pride ourselves in lovingly and uniquely creating each yoga retreat. For this retreat, expect inspiring yoga classes + nourishing meditation + profound pranayama + stress relief classes + introspective journaling + relaxation + nourishing catered meals + an all-round feel good experience: Find Your Bliss. Camp Bliss is nestled in 48 acres of pines and between three scenic lakes. The spacious, rustic Camp Bliss Main Lodge has over 7,600 square feet, 25-feet high ceilings with a wall of windows facing Long Lake. 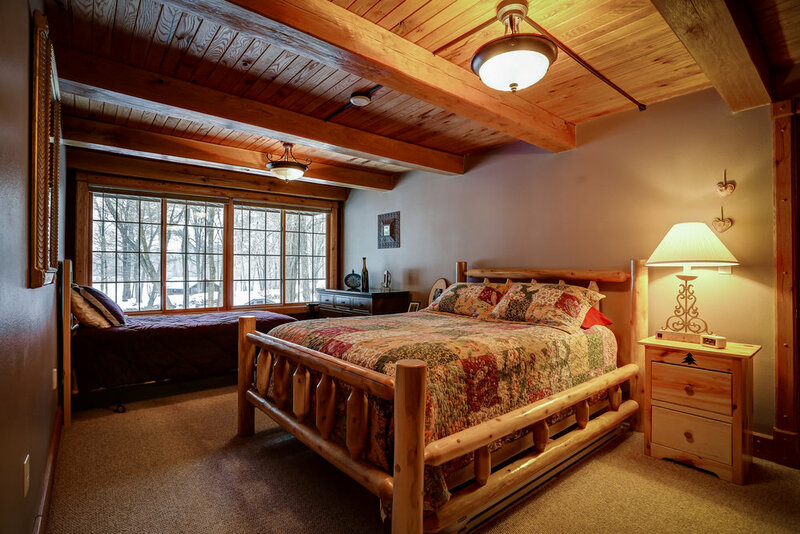 The Lodge sleeps 15+ people with five bedrooms, two lofts, three stone fireplaces, two sofas, a bunk room, and four bathrooms, two with accessible roll-in showers. Bed linens are provided, you supply own towels, washcloths, and dishcloths. Newly remodeled kitchen has a center island, stainless steel appliances, dishes, and cookware. Two beautiful lounges, with comfortable leather furniture, are located at each end of the Lodge. Free Wi-Fi. Great Room: open space with 25-feet high ceilings, a wall of windows facing Long Lake with a huge stone fireplace. Living room: stone fireplace and a sleeper sofa that folds out. Welcome Lounge: gathering area with comfortable leather chairs, relax, enjoy the beautiful views. 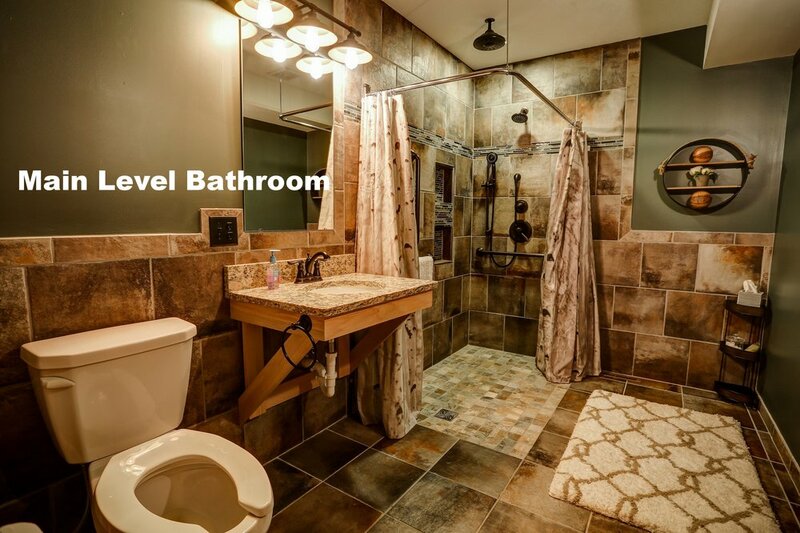 Two Bathrooms: one with an accessible roll-in shower. 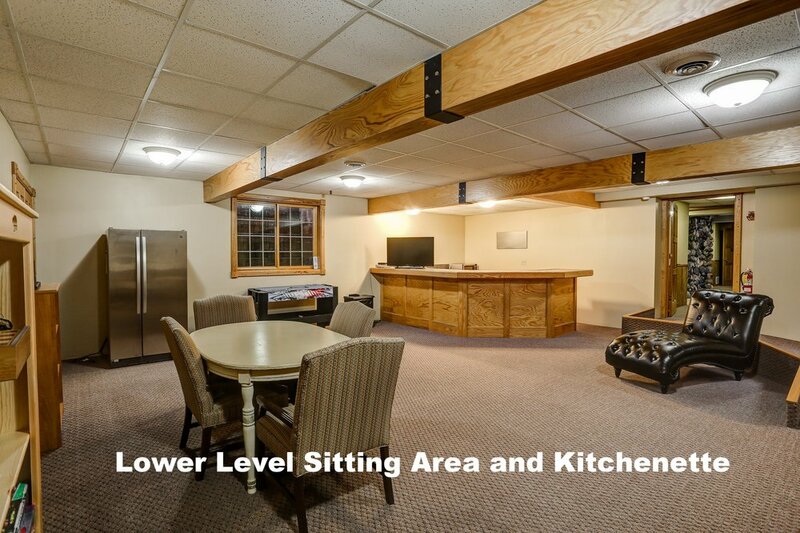 Game Room: bar, refrigerator, pizza oven, foosball table, 1 sofa, game table. Enjoy the decks facing Long Lake, pull up a chair by the outdoor fire pits and enjoy the views of three lakes on our property. We have gas and charcoal grills, a large swing set, basketball court, many outdoor activities, nature walks, hiking and cross-country skiing. Canoe, paddle boat, kayaks, paddle boards are free to use. The boat launch is less than ½ mile from our back entrance on Long Lake. The Bliss House has been completely renovated. The decor and feel of this artistic home is stunning. 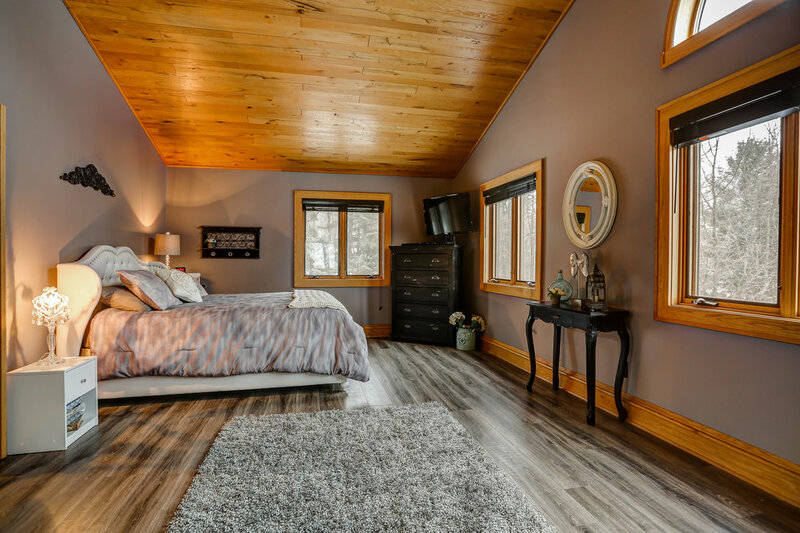 The Bliss House can sleep 10+ people with seven bedrooms and four bathrooms (two private ensuite bathrooms and two shared bathrooms). Each level features a full kitchen, living room, bedrooms and free Wi-Fi. Five bedrooms on the upper level with a master en-suite with double sinks and a Jacuzzi bathtub. Lower level features a stone fireplace in the living area, two bedrooms, and an office nook. Bed linens are provided, you supply own towels, washcloths, and dishcloths. The Bliss House is conveniently located 200 feet from the water with 600 feet of Lake Frontage. The Bliss House is only 200 feet away from Long Lake with a new dock. Enjoy the deck facing Third Lake or pull up a chair by the outdoor fire pit and enjoy the views of three lakes on our property. We have gas and charcoal grills, a large swing set, basketball court, many outdoor activities, nature walks, hiking and cross-country skiing. Canoe, paddle boat, kayaks, paddle boards are free to use. The boat launch is less than ½ mile from our back entrance on Long Lake. If you are interested in a cute, private, one-bedroom cabin all to yourself (max of 4 people) - feel free to inquire with us. We did not reserve the cabin, but we could look into it for you. We believe it would be approximately $700 + General Admission to rent the cabin and take part in the retreat. The Cabin is a short walk to the Main lodge: located directly on the shoreline of Third Lake. Enjoy your privacy and a very short walk to meals, classes, workshops, and more. Quaint, lakeside cabin, steps from sandy beach, has a large private deck at the water’s edge to enjoy the beautiful views. One bedroom plus a loft. 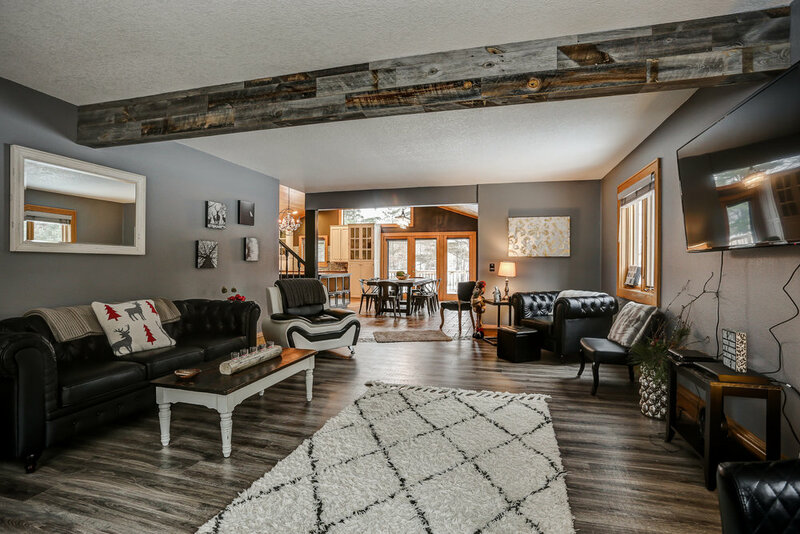 Full kitchen with breakfast bar, separate dining area, plus a cozy living room and an outdoor fire pit. Enjoy the cabin and deck facing Third Lake, literally on the water’s edge! Pull up a chair by the outdoor fire pits and enjoy the views of the three lakes on our property. We have charcoal grills, a large swing set, basketball court, many outdoor activities, nature walks, hiking and cross-country skiing. Canoe, paddle boat, kayaks, paddle boards are free to use. The boat launch is less than ½ mile from our back entrance on Long Lake. Lots of layers - we never know what Minnesota weather will be like! If you plan to use kitchen space to cook/prepare snacks: the kitchens have some items (8-12 place settings and cookware), but we recommend bringing cooking/eating items you need as well as dish clothes and dish soap. There will be coffee pots available in each building. We will have coffee and tea available in the Main Lodge. If you are a coffee/tea savant and/or staying in The Bliss House - we recommend bringing your favorite morning beverages to ensure a blissful stay. Make a one time payment in the full amount of the general admission price + your bedroom price to benefit from discounts. (First come, first serve on room selections.) - Need a payment plan? Keep reading, we are here for you! Not sure which room option is best for you? Send us an email at hello@borealblissyogaretreats.com with any questions! We will help you select the best option for your individual or group stay. In need of a payment plan? Purchase your bedroom option and add $50 as a non-refundable deposit to reserve your desired bedroom. Purchase your bedroom option and add an extra $100 as a non-refundable deposit to reserve your desired bedroom. Example: If your desired bedroom below is listed for $100, you will need to provide an extra $100 to secure your room. Total deposit equaling $200. The remaining balance of $470 will need to be paid in full no later than March 31st. REGISTER BY APRIL 2ND AND SAVE! Register by April 2nd and your registration will include THREE MYOFASCIAL RELEASE TOOLS. We will be utilizing a myofascial release ball and two tennis balls in session. The experience is so incredible, you will definitely be wanting to take these tools home for own personal use! Register by April 2nd: your price will include these tools, valued at $25. Button below will take you to fillable questionnaire. To complete payment and reservation, we will send you an invoice within 24 hours via email based on your answers. Room reservations are first come, first serve. Please add hello@borealblissyogaretreats.com to your email contact list upon purchase. We have found that some of our emails may end up in your junk/promotional folder and this is how we alert you of information and helpful suggestions about the retreat. A pre-retreat survey will be emailed to you one month prior to the retreat weekend with questions regarding dietary needs, hopes and dreams, etc. IN NEED OF A PAYMENT PLAN? 1. Provide a deposit and pay in full by February 28th- Your bedroom price serves as a non-refundable deposit. Add $50 to non-refundable deposit to reserve your desired bedroom and benefit from the extended payment plan option. Example: If your desired bedroom below is listed for $100, you will need to provide an extra $50 to secure your room. A total deposit equaling $150. The remaining balance of $470 will need to be paid in full no later than February 28th <<< Registration open on January 4 at Noon - info below >>> 2. Provide a deposit and pay in full by March 31st- Your bedroom price serves as a non-refundable deposit. Add an extra $100 to non-refundable deposit to reserve your desired bedroom and benefit from the extended payment plan option. Example: If your desired bedroom below is listed for $100, you will need to provide an extra $100 to secure your room. A total deposit equaling $200. The remaining balance of $470 will need to be paid in full no later than March 31st. Is there anything else you'd like us to know at this time? Thank you so much for your submission. Rooms are on a first come first serve basis. We will email you an invoice within 24 hours with additional information. We look forward to spending this weekend with you! We hope that you can appreciate the amount of time, love, and energy we wholeheartedly put into each retreat. Not just during the event, but the many months leading up to it. Please do think carefully about registering.